Last December DJ Shadow was booted off the stage at Mansion Miami after only playing 20 minutes. He has since gone on tour promoting that mix called the 'All Bases Covered' tour. 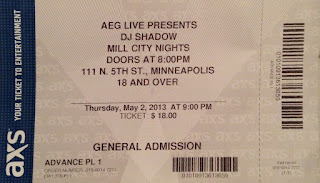 He stopped at Mill City Nights this time around to do a traditional DJ set, as oppose to the last time he was here at First Ave for the 'Live from the Shadowsphere' tour which had some pretty impressive production. He started off the night by letting the audience know that he's basically going to play what he thinks is good music and that he's recently been experimenting with bass music. Later, he mentioned that those in the back probably aren't sure why they're here, but hope they learn something anyway. Midway through he pointed out the fact he was doing this all sans laptop. I'm a huge DJ Shadow fan, but man, he really sounds like he's got a chip on his shoulder. Mind you, the 2nd floor was closed off and there was plenty of room to move. We get it, you're not a mainstream DJ and you're not going to conform to the current EDM world just to make a quick buck. It was clear because that's all you seemed to talk about. In other words, he was "too future" for most people. The show itself was good otherwise. If you've been to an EDM show of any sort and wondered what exactly the DJ is doing up there or if they're doing anything at all; it was obvious at this show. Not only did you hear/see all the regular DJ Shadow tricks (mixing, sampling, scratching), but you also saw him drum live on a drum machine. He's just not up there appearing to adjust the volume and twist some knobs he's doing what you'd expect a DJ to be doing. The music was good and got most of the crowd to move almost the whole time. My only gripe (other than his griping) was the bass. It was so overwhelming it was almost a distraction. In fact, it was a bit of a relief when he'd let up and you could actually hear the music. He ended the show with a live rendition of the his classic, Organ Donor. 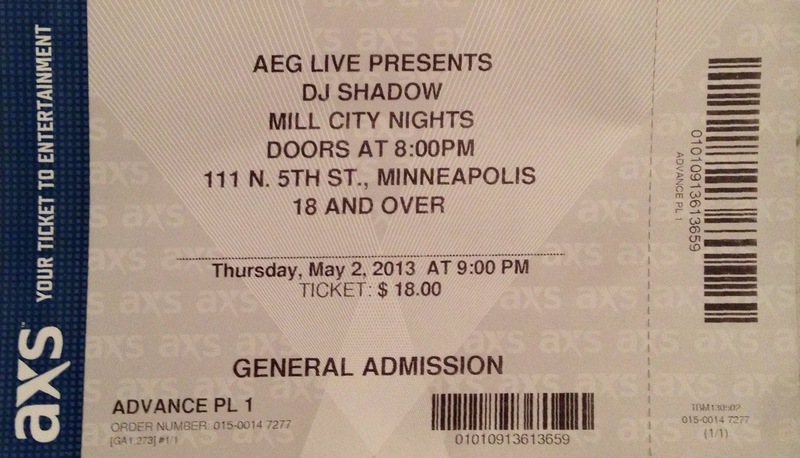 Since I got hooked on DJ Shadow with Endtroducting, this was the highlight of the night. Based on the reaction of the rest of the crowd, I imagine it was their highlight as well.